This way to cook lamb roast is a great in more than one way. 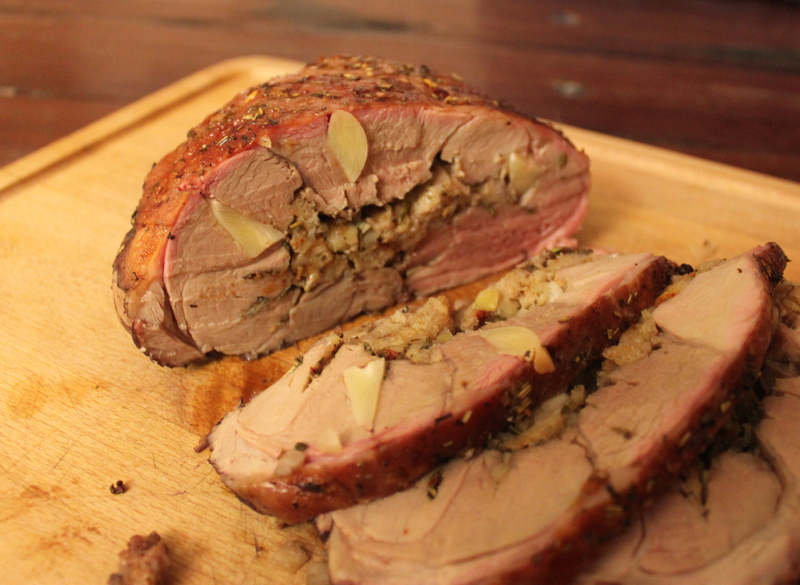 If you are one of those lamb ‘haters’ that have had an unfortunate experience, you should not be afraid to try this. Most people have tried to eat lamb, thinking that they eat a hundred year old sheep – it tastes like wet wool, growth in your mouth and has a horrible aftertaste. Such an experience can ruin everything, but we promise that this time you will experience the true glory of lamb meat (and hopefully forget all about the bad experiences). Begin by making the breadcrumbs. Take what correspond to 1 1/2 cup of leftover bread (we alway have some in the freezer) and cut it into small cubes. Bake in the oven at 400F for 10 minutes or until golden brown. Set a side. Chop the shallots, almonds and half of the garlic cloves finely – keep separate. Remove the bone from the lamb shoulder (if you buy it at your local butcher, you can ask him to do it). 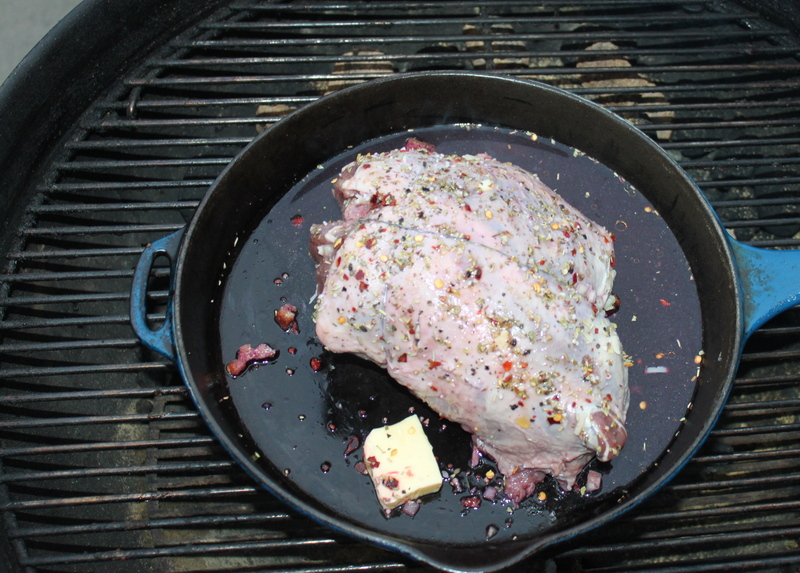 Spread out some olive oil on the inside of the lamb shoulder and sprinkle it with 2 tbsp. of Italian seasoning and the chopped garlic. Mix the breadcrumbs with the chopped shallots and almonds, grated parmesan cheese and put on top of the all the other ingredients. Top it of with thin slices of butter (make sure that you can close the meat completely – if not, you have used t much stuffing). Tie up the lamb shoulder together and make sure that the stuffing can’t fall out. Take a small kitchen knife and cut small incisions on the outside of the tied meat. Stuff the incisions with the rest of the garlic cloves. Top it of with olive oil and the remaining 2 tbsp. Italian seasoning. 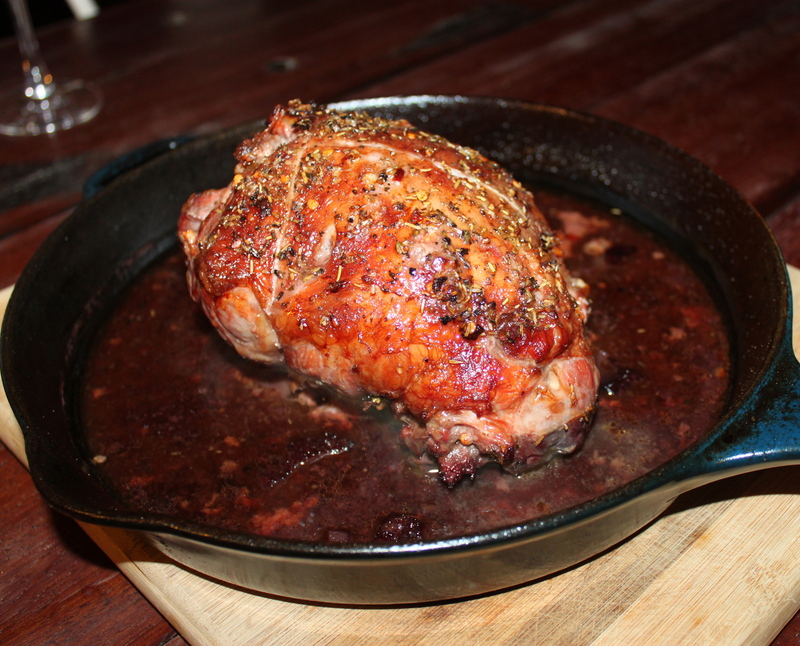 Place the stuffed lamb shoulder in a cast iron pan or an ovenproof tray. Pour in the red wine and 2 tbsp. butter. Let rest in the fridge while prepping the (kettle) grill. Set the grill for indirect heating (coal in one side). The temperature should be around 320F. The meat should cook approximately 30 minutes per pound or until it the internal temperature reaches 158F. Set the cast iron pan with the meat in the middle of the grill and put on the lit. Turn the pan halfway through the cooking process, so it gets cook evenly on both sides. Remove from the grill when it has reached the target temperature and let rest for 10-15 minutes. 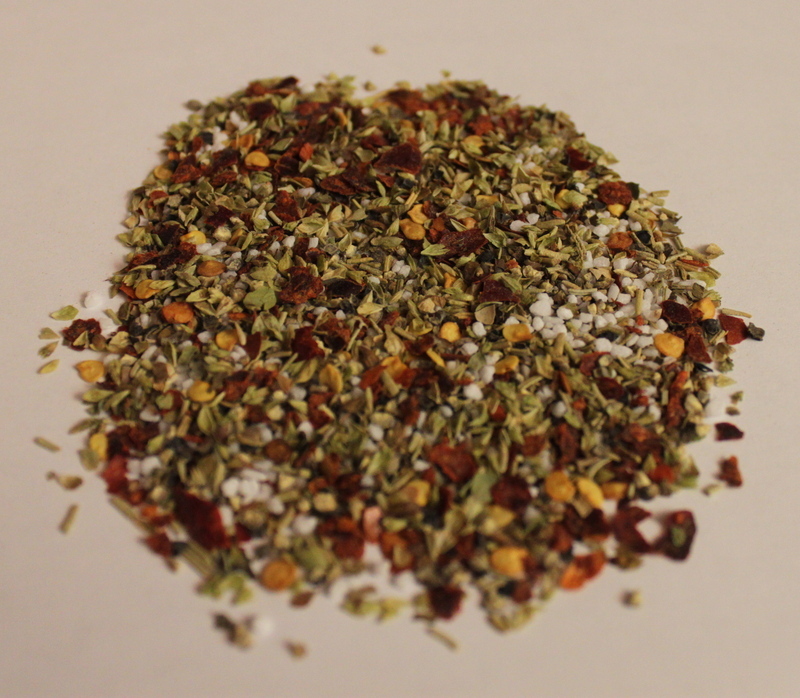 This Italian seasoning is a favorite of ours, when we cook lamb. It is also good for chicken and pork meat. Combine all ingredients in a bowl and mix well. Store in an airtight contain at room temperature. I really had trouble deciding on tonights dinner. First I didn’t want to cook at all, then I wanted to make steaks – again (I am a true meat lover, and gets large steaks instead of flowers on Valentines day :-)), then I wanted pork cheeks and finally when I opened the freezer and saw the tiger prawns I decided on this fabulous recipe. Prawns and spaghetti is the perfect combination – just change the sauce and your have can make hundreds of different dishes. This one is definitely in our top 10 when it comes to dishes containing spaghetti. Heat the oil in a frying pan over medium heat. Add chopped shallots, scallions, chilies and garlic. Cook for 5-10 minutes or until the onions turn golden. Stir occasionally to avoid that the onions get burned. Add white wine, tomatoes and cream. Cook for approximately 25-30 minutes. While cooking, chop the fresh tomatoes into quarters. 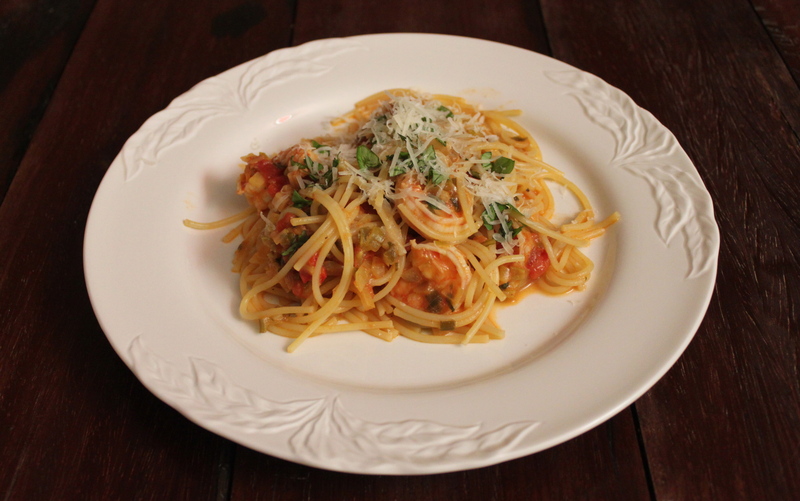 When the tomato sauce has thickened, add the tiger prawns and continue to cook for 4-5 minutes. Add the fresh tomatoes and 2/3 of the chopped basil leafs and stir to combine. Season with salt and pepper. Add the sauce to the drained spaghetti and toss to mix. Arrange on a pretty dish and sprinkle with parmesan cheese and the remaining 1/3 cup chopped basil leafs. Are you a fan of cauliflowers too? Not many are and most people associate cauliflowers with a vegetable that is easily over cooked and boring. But that does not have to be the case. Actually, we rarely cook the cauliflower, as we think that the crispiness and fresh taste of the raw version is much better. Begin with whisking together sour cream, mayo, vinegar and confectioners sugar. Whisk until the dressing is smooth and creamy. Set aside while prepping the rest of the ingredients. Chop the onion and basil leafs and mix with the cauliflower bouquets. Then pour the dressing over the vegetable mix and mix well. Let rest in the fridge for at least 10-15 minutes, preferably 1 hour. While the salad is resting, you have time to roast the almonds. Heat up a frying pan and add the almonds. Roast at medium heat for 4-6 minutes. Stir occasionally to avoid the almonds from burning. Remove from the heat, when the almonds begin to release their nutty and delicious aroma. Chop when cooled. 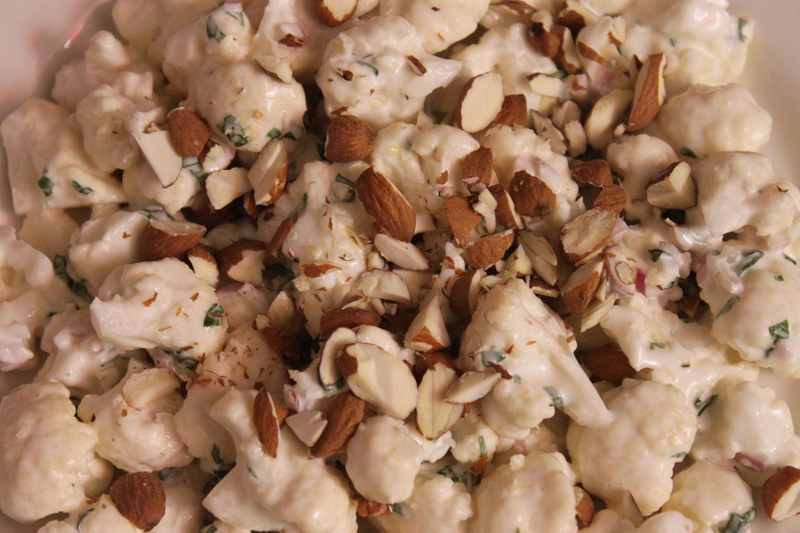 Add 2/3 of the chopped almonds to the salad just before serving. Mix well and arrange the salad on a beautiful plate and sprinkle the remaining almonds on the top. What did you have for sinner last night? 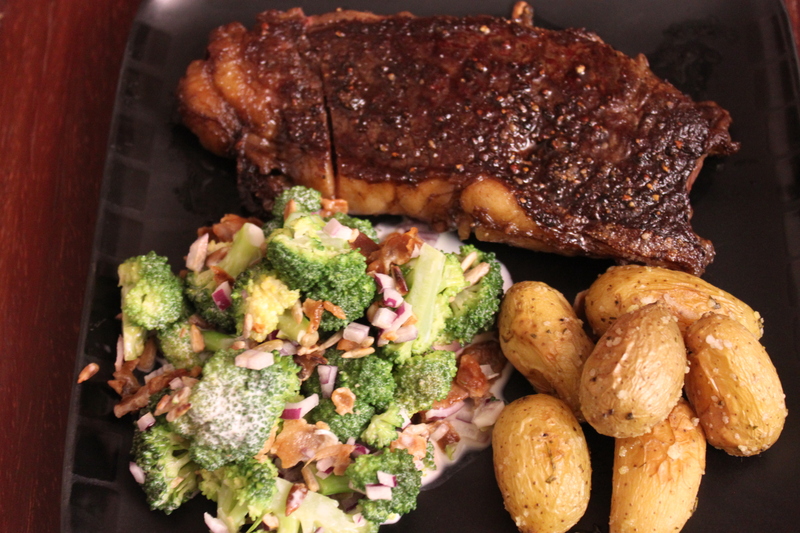 We had juicy steaks with oven roasted potatoes and a crispy broccoli salad. It is easy to make, has a crispy texture and tastes delicious. Broccoli is one of those vegetables that most people like in one way or the other. 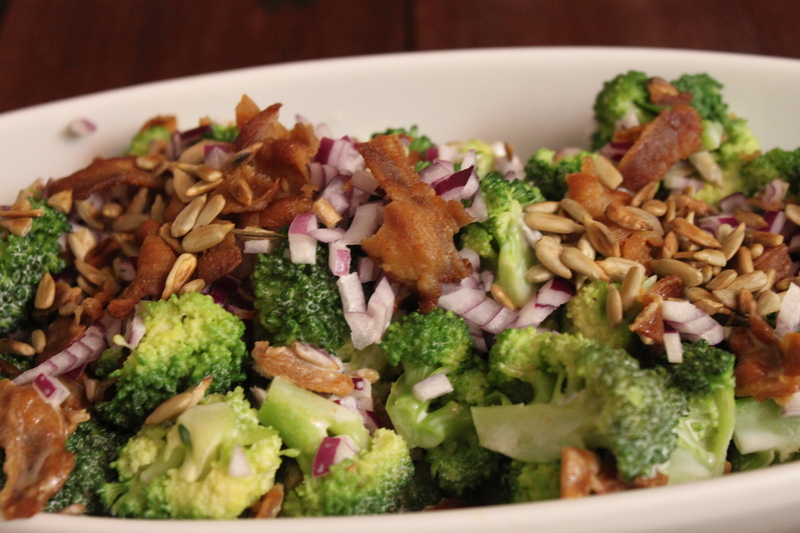 Our favorite is this broccoli salad with crispy home made bacon and roasted sun flower seeds. Some other good ideas for broccoli recipes is broccoli with melted cheddar cheese and broccoli soup with chunks of creamy blue cheese (recipes will follow soon). Parboil the broccoli set a side while prepping the rest of the ingredients or until they reach room temperature. While waiting for the parboiled broccoli to cool, fry the bacon until crisp and light brown. Transfer to paper towels to soak the remaining fat when finished. Cut the inions into small cubes and roast the sunflower seeds, until they begin to get a bit of color. Stir to avoid that the seeds get burned. In a separate bowl whisk together sour cream, mayo, vinegar and confectioners sugar. Whisk until smooth. Combine broccoli bouquets, onions and dressing in a bowl and combine well. Let rest for at least 5 to 10 minutes (preferably for an hour) in the fridge. Just before serving, add the roasted sun flower seeds and crispy bacon and serve as a side dish for a delicious steak, pork chops or stuffed chicken breast. How often do you use bacon when cooking? We use it several times at week for all sort of food and therefore decided to try and make it ourselves. We have tried several different methods before deciding to recommend this one. It is quite time consuming, so be sure to make enough, so you don’t run out within the first few days. Before beginning on your on bacon project, it is important to have a few key notes in mind. First of all, you need time and patience. It takes about 8-10 days from start to finish. Second, don’t smoke it on a hot summer day, as the temperature needs to be below 81 degrees fahrenheit throughout the whole smoking process. If it gets to warm it can begin to deprave and the last weeks work will be lost. If you get the pork belly with bone in, remove the bones and use for stock or something else. Also remove the skin, but not the fat. 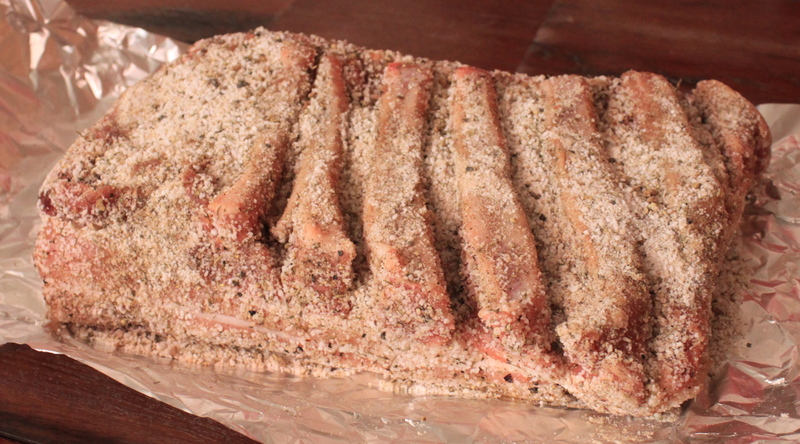 Mix together all the dry ingredients and rub firmly into the pork belly. Make sure that all sides of the meat has a good layer of rub on it. Wrap it closely in tin foil and put in an airtight bag. Remove all air and seal the bag. Refrigerate for at least 5 days (preferably 7 days) and rotate every day, to make sure that the meat juice don’t stay in the bottom. 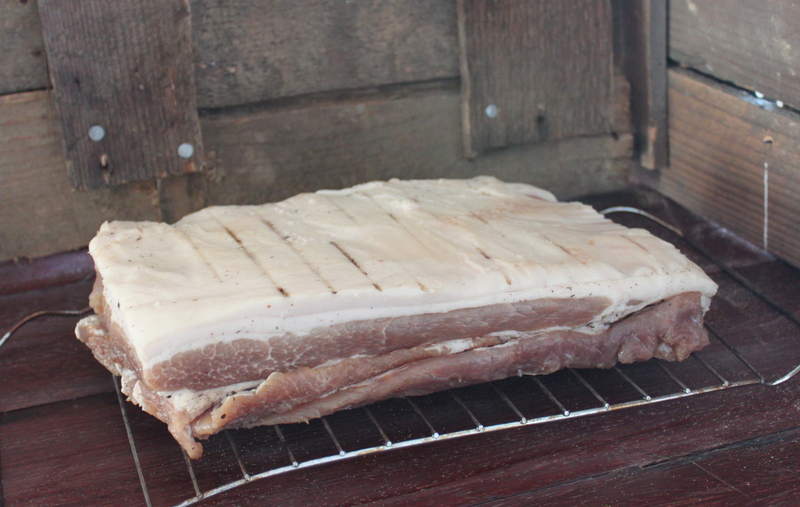 When refrigerated for 5-7 days the pork belly is almost ready to be smoked. Clean the meat for rub by rinsing it thoroughly in cold water for a few minutes. Make sure that all rub is removed and dab it dry with some paper towel and let rest on the kitchen table while preparing the smoker. 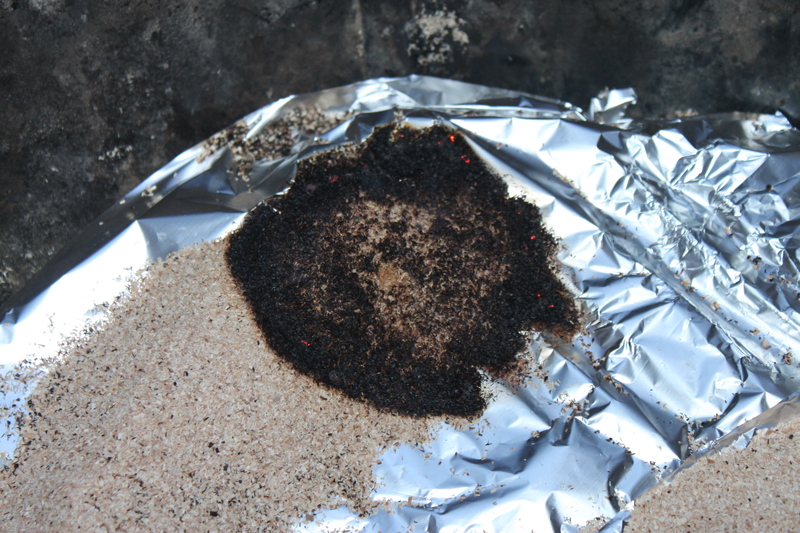 To smoke the bacon you will need a smoker or kettle grill, some tin foil and 1/2 a pound sawdust, a tbs. household alcohol, a small grid and a lighter. We own both a smoker and a kettle grill and this time we decided to use the kettle grill, but it makes no difference whether you use one or the other when smoking bacon. Cover the bottom gridiron of the grill with tin foil. Place the saw dust in an unclosed circle around the edge of the grill. Make sure that the circle does not close, as this will shorten the the smoking time (in a closed circle the smouldering will burn both ways from the starting point, and thereby burn faster). Pour the household alcohol over one end of the sawdust and light it. Wait till there is a good smould, and then blow out the fire – this takes approximately 5 minutes. Make sure that the glow continues before adding on the pork belly. When you are sure that there is a good glow in the sawdust, add the pork belly on a grid. If you use the grid from the grill, make sure that it is clean, as the temperature is low and therefor not able to kill any bacterias. For that particular reason we use a small grid which we can clean completely before and after using it. Place the meat in the middle of the kettle grill/smoker and put the lid on. The bottom valve should be full open while the top valve should be a little below half. This bring oxygen to the smoking process, while keeping the smoke inside. This method keeps the sawdust smoldering for approximately 12-15 hours. After 12-15 hour the sawdust has burned out and you are ready to take the next step in the ‘home-made bacon’ process. If you prefer the bacon taste more smoky you can double the smoking time. 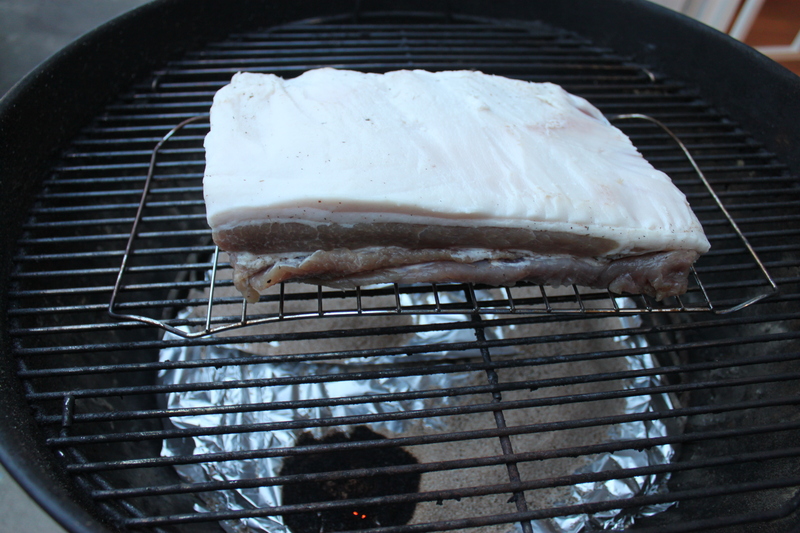 Remove the smoked pork belly from the smoker, and lay it uncovered on a plate in the fridge for approximately 24 hours. 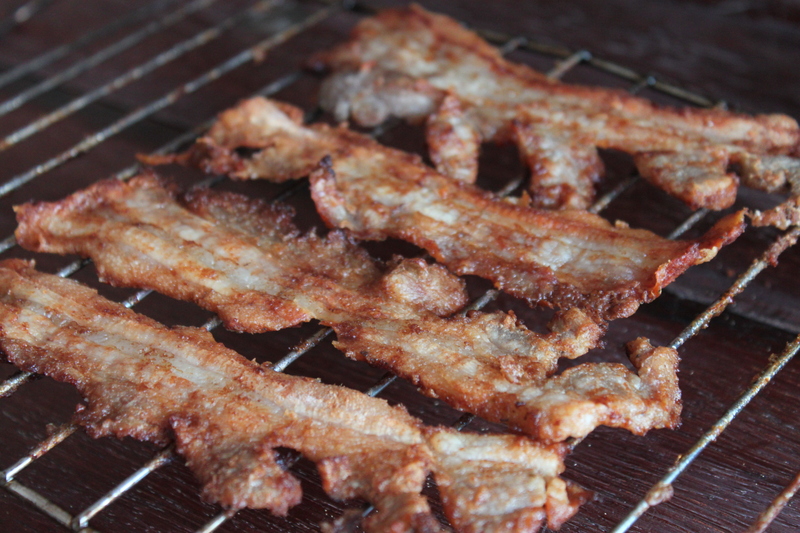 Cut it into cubes or thin slices and prepare it for your favorite bacon meal. We use it among other things in the morning, making eggs and bacon, for lunch making bacon sandwiches and for dinner making cheese burgers, broccoli salad or bacon explosion. 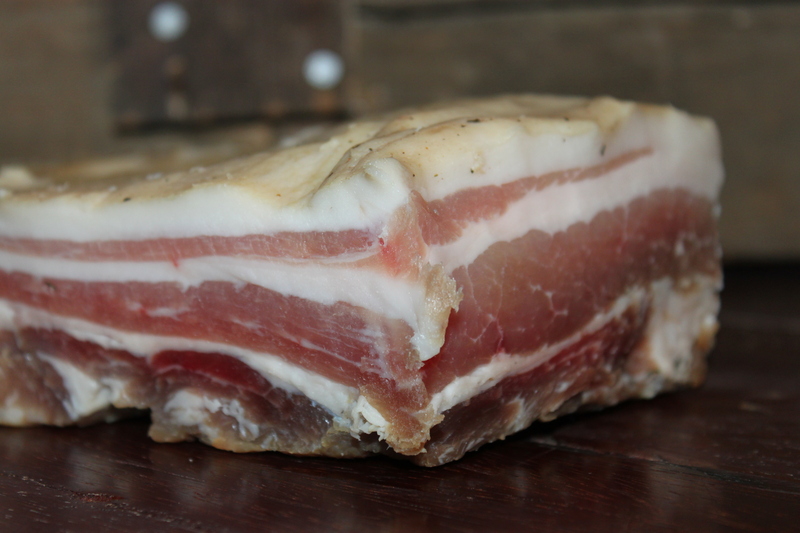 If you have never tasted home smoked bacon, you are missing something out of our life! It cannot be compared to super market bacon, which is less tasteful. 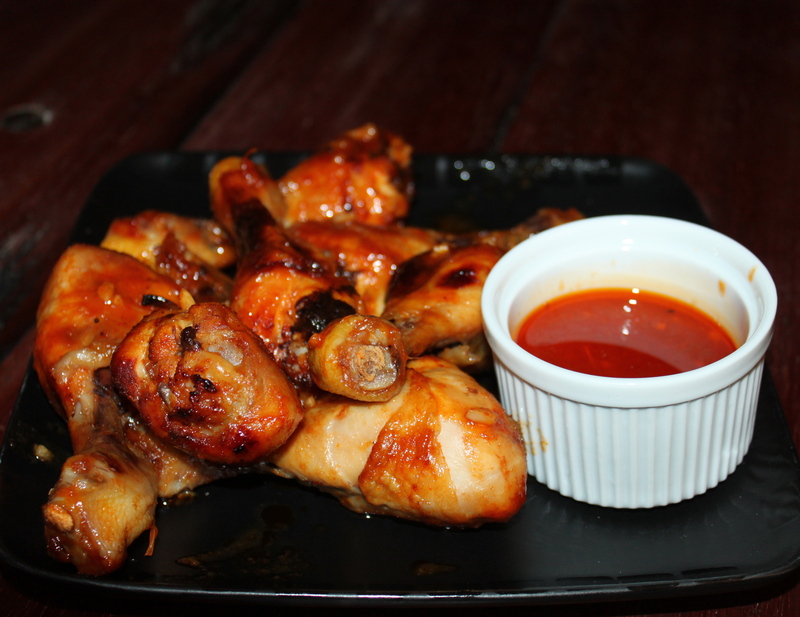 Hope that you will consider trying the recipe as we believe it bring the most exceptional and delicious result.